The spin attack in action, in Sonic 1. The term "spin attack" refers to Sonic and his friends being able to curl into a ball in order to smash badniks, either rolling along the ground or jumping through the air. It has been known by various other names such as the Super Spin Attack, Super Sonic Spin, and so forth, depending on the game in which it is featured. First introduced in Sonic 1, the spin attack has been referenced in virtually all Sonic-related media to date. The spin attack is an offensive or defensive maneuver. It can be used to attack or preempt enemies, or even to break certain walls. The theory behind this behavior is that when Sonic performs the move, he rolls up into a ball, causing his spines to be exposed. These spines combined with his intertia and momentum is what causes the enemies to take damage. Enemies that utilize spikes, flame, extreme cold, etc. counteract the spin jump and cause damage to the character performing it. When Tails was introduced in Sonic 2, he too was able to perform the move, even though he has no spines. Knuckles's introduction in Sonic 3, and his ability to perform the move as well, set a precedent that the move is a standard offensive for characters in the Sonic universe. Other characters such as Cream, Mighty, Ray, Rouge, Shadow and Vector are able to perform the move, whereas others like Espio have similar but different offensive abilities, and still others such as Amy (before Sonic Advance 2, armed with a large hammer to compensate) and Eggman (who generally uses various machines to attack) were shown to jump without spinning. In most 2D Sonic games, simply press while in motion (a minimum velocity is required) to cause the character to roll into a ball. While the character would normally be harmed by touching enemies, if the character is spinning while touching them, most enemies would be destroyed, though some are shielded against the ability, or can harm the player otherwise. The spin roll is distinct from the charge-up spin dash move, although a spin dash evolves into a particularly high-velocity spin roll. In the 3D games, a non-directional button is assigned to this ability; please see the game's manual for details. The spin jump destroying a Madmole in S&K. The name spin attack also refers to the ability of the character to jump and spin simultaneously. 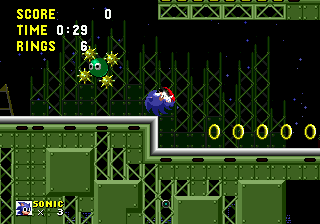 This "spin jump" is the primary offensive maneuver of Sonic and others in the games. Unlike hop-n-bopper heroes such as Mario or Diddy Kong, who must make contact with their feet in order to defeat an enemy, the spin jump enables the character performing it to roll up into a ball while jumping, causing most badniks that come into contact with any portion of him/her to be defeated. It is assigned 1 to 3 buttons depending on the game, and pressing the button will cause the character will jump and spin into a ball at the same time. This is the primary form of both attack and vertical movement in most Sonic games. This maneuver has been known by many names over the years. The Sonic 1 instruction manual refers to it as the Super Sonic Spin AttackMedia:Sonic1 MD US SonicJam manual.pdf, as at the time, Sonic was the only character who could perform the ability. This maneuver will increase Sonic's speed while traveling down declines, but will decrease his speed on level ground (as he can no longer propel himself forward, and instead relies on inertia). While in this curled-up state, Sonic's hedgehog quills are displayed prominently, allowing him to destroy most enemies by plowing through them. In the same game the name also referred to Sonic's ability to jump, while simultaneously performing the spinning maneuver. This was his primary form of attack in the game, and can be performed by pressing the , , or buttons while on the ground. The longer you hold down the button, the farther up he jumps. Certain walls in the game can be broken by performing the spinning roll, but not the spinning jump. The two abilities from Sonic 1 appear in virtually all 2D Sonic games. Once new characters were introduced into the franchise with the same spin ability, Sonic's name was dropped from the maneuver. The word "Super" is used randomly and inconsistently, obviously used to make Sonic's trademark ability seem cooler. In Sonic 2, the rolling was "to spin" and the jumping "to spin jump" on the initial control page, then both as the Super Spin Attack on the next page of Super Stunts; Sonic's partner, Tails, can also perform the maneuver, hence the removal of the Sonic name. Sonic 3, its sequel which introduced Knuckles into the franchise, again uses this name for both. Sonic CD refers to the jumping as the Spin Attack on the control page, and the rolling as the Super Spin Attack on the Sonic's Super Stunts page. Games after this generally cease referring to the move specifically. Although the ability is present in virtually all Sonic games, they often only mention the ability to jump, as well as the ability introduced in Sonic 2 known as the spin dash. Sonic Jam was the first time Sonic entered 3D platforming. The 3D hub for the extra features, Sonic World, armed Sonic with a jump and... well, that's pretty much it. There was no way of performing the Spin Attack on the ground. When Sonic Adventure came out for the Dreamcast in 1999, Sonic, Tails, and Knuckles were armed with both spin attacks. Jumping was performed with the button, and spinning was performed when running and pressing the or buttons. This page was last edited on 9 January 2017, at 13:45.